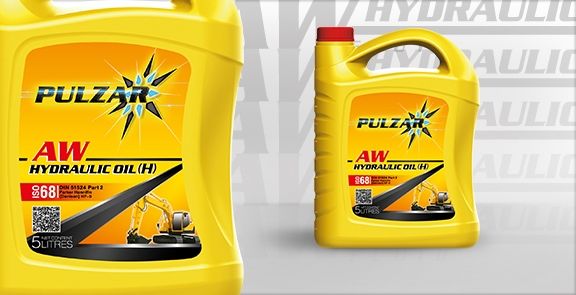 PULZAR AW HYDRAULIC OIL is a zinc-based premium anti-wear hydraulic oil invented from the latest emerging technologies. It is specially formulated for powerful, sturdy new hydraulic equipment designed for greater strength and agility but relatively compact and easy to service. PULZAR AW HYDRAULIC OIL protects against wear in both high and low pressure hydraulic systems by preventing oil and water from mixing, even in the most severe industrial and mobile applications. PULZAR AW HYDRAULIC OIL provides excellent thermal and oxidative stability. The unique additive packages used in PULZAR AW HYDRAULIC OIL enhance systems’ durability, maintains performance and extends both oil and hydraulic system life. It can function for long periods without forming sludge, varnish or other contaminants that can degrade operation and performance of hydraulic system components. PULZAR AW HYDRAULIC OIL exhibits good demulsibility, enabling any contaminating water to be drained from the reservoir when the system has been idle for a long period of time. Excellent rust and corrosion inhibitors make PULZAR AW HYDRAULIC OIL ideal for hydraulic systems that operate in moist and corrosive environments. The specially selected anti-foam additive offers a complete system protection from loss of lubricity due to foaming. PULZAR AW HYDRAULIC OIL meets or exceeds requirements for industrial and mobile hydraulic systems which call for Parker Hannifin France (Denison) HF-0 and DIN 51524 Part 2. It can be used in a wide variety of equipment including hydraulic presses, machine tools, hydraulic systems on mining equipment, oil lubricated electric motors and generators, palletizers, gear sets requiring an API GL-1 gear oil, packaging equipment, calendars, grinders, die casting machines and other equipment requiring a premium quality hydraulic oil. PULZAR AW HYDRAULIC OIL can also be used for compressors that call for a non-detergent motor oil. It is stable enough for more sensitive applications such as coaxial piston pumps and hydraulic transmissions.